An armed man held-up two Michigan Avenue boutiques during afternoon hours this week and police are asking for the public’s help in tracking him down. Shortly after noon on Monday, the man entered the Arts & Artisans shop at 321 North Michigan, displayed a silver handgun in his waist, and took money from the register. Then, around 4:30 p.m. on Wednesday, he did it again at Nakamol, a shop located directly across the street from Arts & Artisans at 336 North Michigan. According to police he again displayed a silver gun in his waistband and took the store’s cash. In both cases, the man placed the money in a blue tote bag before heading southbound on Michigan Avenue. Police today said the man is black, 40- to 50-years-old, and 5’5” to 6-feet tall. He has been wearing a black ski hat with a green stripe, a white construction mask, a long black leather coat, and a gray hoodie with blue jeans that have a white mark on the shin. Anyone with information about the suspect is asked to call Area Central detectives at 312-747-8384. 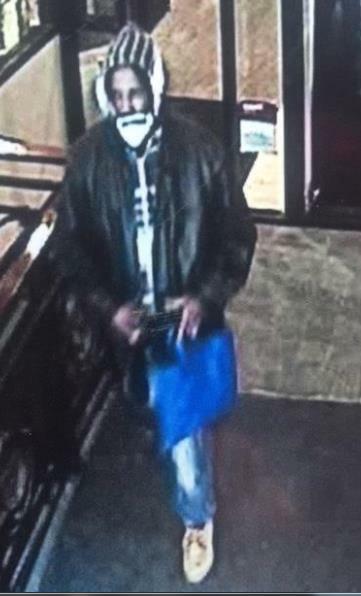 The man’s brazen hold-ups are just another indication of how bad the Loop's robbery situation has become. As CWBChicago reported on Monday, robberies there were up 106% year-over-year through February and up 392% compared to the same time in 2014.